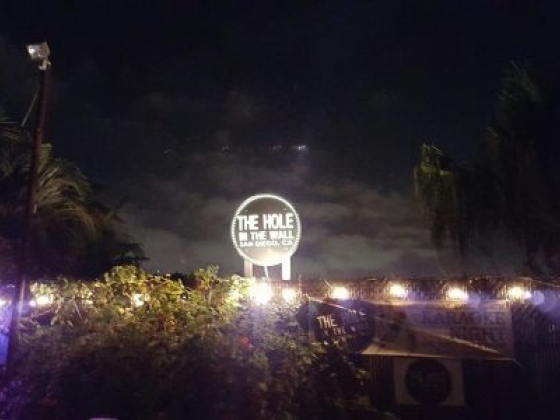 Since the day it opened back in 1942, The Hole in the Wall has a earned a reputation as a world famous "dive bar". Consistently rated as one of the friendliest neighborhood bars in San Diego, you enter through a nondescript entrance and step down in to a cool classic tropical patio. The atmosphere is all about old school fun, with a pool table, ping pong, glow pong and a variety of board games (both new and old) for patrons to enjoy. With an outdoor fire pits surrounded by the largest outdoor smoking patio in San Diego, you are never at a loss to find a place to sit undisturbed. Check out the bar's event schedule for what's on the menu, as it changes throughout the week. Our ongoing events are Karaoke and Beer Pong every Friday as well as trivia night on the first Friday of every month. Comedy and Thai food on Thursdays as well as a monthly charity bingo event on Saturdays with door prizes. The home of San Diego's original Sunday Funday, you have to get there early to guarantee entrance. Patrons queue up for Flaco's Grill on Sunday which offers an appealing collection of hot dogs and burgers (rumored to be the best in town). With a dozen different beers on tap featuring local breweries as well as our own house specialty cocktails, The Hole in the Wall is a dive bar that's well worth searching out!